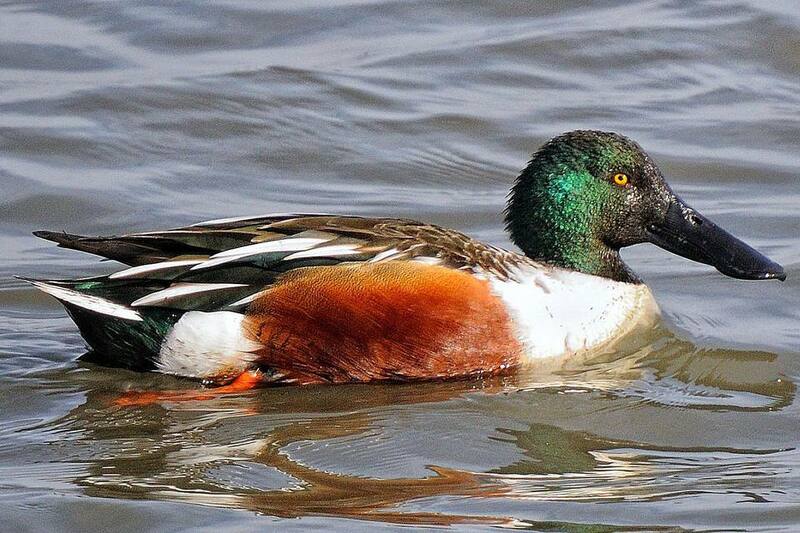 Aptly nicknamed the spoonbill, the northern shoveler has the largest bill of any duck in North America. The bill is longer than the duck's head, and has a flattened wide tip perfect for "shoveling" along the water's surface for food. But what else makes these members of the Anatidae bird family so distinctive? Discover more about the spoonbill duck with this informative fact sheet. The northern shoveler's broad, spatulate bill is its most unique feature, and the bill is black on males and smudged orange-gray on females. There are other field marks that stand out on both males and female, however, and birders who are familiar with all these features will have no trouble identifying the spoonbill, even if they don't see the duck's characteristic bill. Males have an iridescent green head that can look black when in shadow or poor light. The breast is white while the abdomen and flanks are chestnut with a white patch at the rear. The dark back shows some brown mottling and white streaking. The black rump may also show iridescent green. Females are mottled brown, buff, and black overall with darker upperparts, finer streaking on the head, and a faint dark eye line. Both genders have yellow eyes, bright orange legs and feet, an iridescent green speculum, and a powder blue wing patch visible in flight. Juveniles look similar to adult females but have a grayish wash on the head, neck, and upperparts until they molt into their adult plumage. These ducks are not very vocal, though males do use different calls as part of their courtship behavior. Typical calls include a slow, nasal bray with only a few clunky syllables, as well as a noisy rattle upon takeoff. Shoveler ducks prefer freshwater lakes, marshes, estuaries, and wetlands with shallow, muddy edges and gentle slopes for easy access. Within their range, these ducks may also occasionally be found in suburban habitats where ponds or lakes are found in parks, especially if the area is rich in other suitable habitats. These birds can be found year-round in parts of the mountain west of the United States, including Utah, southern Idaho, and eastern Oregon and Washington. Northern shovelers are found in similar habitats in Europe and Asia, staying year-round in parts of the United Kingdom, France, and around the Mediterranean Sea. In North America, these ducks' summer range extends from Alaska through central Canada south to the mountain regions of Colorado and northern New Mexico and as far east as the St. Lawrence River and Massachusetts Bay. In winter, northern shovelers migrate to the Pacific coast and the southern United States, as well as into the Caribbean, Mexico, and northern South America. In winter, these ducks also spread out from their year-round European range to southern Europe, northern Africa, and the Nile River region and stretching through the Middle East, India, and Southeast Asia into eastern China and Japan. During the breeding season, these ducks are more common in Scandinavia, eastern Europe, Russia, and China. Rare vagrants have been reported in Australia. Northern shovelers are typically found in pairs or alone during the breeding season, but can gather in much larger flocks mixed with other types of ducks, particularly teal or other dabblers, during the winter. When taking flight, these ducks leap quickly into the air for an abrupt takeoff rather than running along the surface of the water to gather speed first. Like all dabbling ducks, northern shovelers are omnivorous and will sample a wide variety of available foods. Aquatic plants, grains, aquatic insects, and mollusks all make up part of their diet. Though shovelers are classified as dabblers, they rarely tip tip up to feed and instead usually skim their broad bills along the surface of the water, appearing to nibble or swing their bills back and forth as they swim. This efficiently strains insects and plants through the lamellae that line the edges of the broad bill so the bird doesn't miss a morsel. These are monogamous ducks and mate after a courtship display that includes different calls, wing flapping, and head dipping. The female builds a shallow scrape nest that may be close to water or could be farther from water in a grassy area, and the depression is lined with down, dry grass, and weeds. The elliptically-shaped eggs are olive, buff, or greenish, and there are 5-20 eggs in a typical brood. The female parent incubates the eggs for 22-26 days, and the precocial chicks can leave the nest within hours of hatching. The female parent will care for the young ducklings and lead them to food for an additional 40-65 days until their first flight. Because of this long care period after the ducklings have hatched, mated pairs of northern shovelers only raise one brood per year. While these ducks are widespread and not considered endangered, they are at risk from toxic contamination, fishing line tangles, and similar threats. Habitat preservation will help conserve their numbers, and in many areas, northern shovelers are carefully managed as a game species for regulated hunting. All birders can take easy steps to help ducks, such as offering nutritious foods, joining duck- or waterfowl-oriented conservation organizations, and buying duck stamps to help with northern shoveler conservation. Like all ducks, the northern shoveler is not a typical backyard bird, though on rare occasions they may show up in a duck-friendly yard. They are more likely to feel welcome in agricultural areas where fields may be flooded and food sources are more abundant. Birders interested in seeing the brightly patterned northern shoveler can visit a variety of shallow marshlands where insecticide use is minimal and wetland edges are allowed to erode to produce mud and weeds for these ducks to forage. These ducks may be found on any shallow, relatively slow-moving waterway, including in wet fields, wastewater facilities, and estuaries within their range. Don't forget to check out even more bird fact files to learn about all types of birds throughout the world.